SHAMOS was written/programmed to render the user the ability to find fixed positions for astronomical objects: the sun, the moon, the stars and the planets. It was written to span time over thousands of years. It also contains routines for the rise and set times of celestial bodies over local horizons. Included into SHAMOS are utilities to take solar bearings for true astronomical orientation, GPS routines for finding directions, and for the solar compass, which can be very handy when a transit is not available. SHAMOS has been written to dovetail with a specific set of field survey techniques. This set of capabilities gives the user many options to determine the time and place of many different solar and astronomical events. The solar bearing is one of SHAMOS's most often and valuable tools. 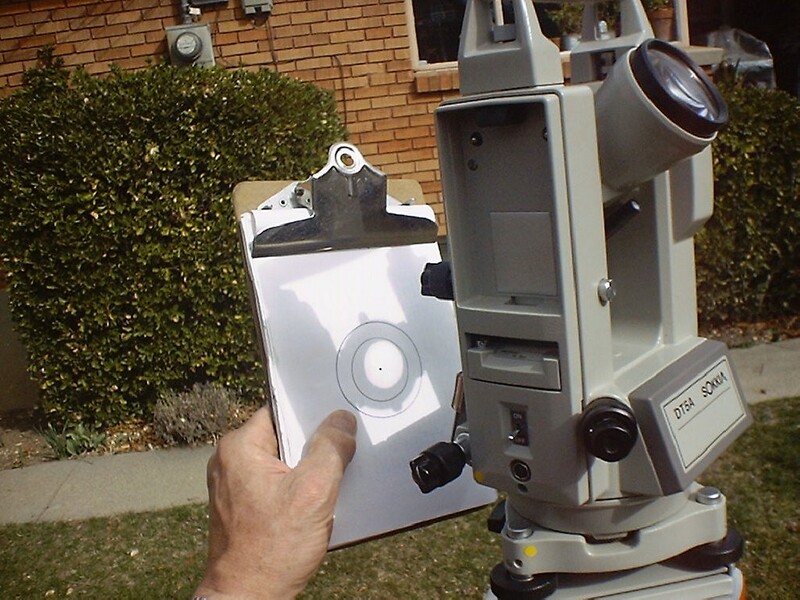 When the sun is visible, a transit can be used to project an image of the sun through its telescope on to a note pad. With the bubbles leveled and a rough magnetic orientation done, when the cross hairs of the transit telescope are centerd in the solar image, then the time, date, azimth and angle of elevation are recorded. Then the sun is centered again on the cross hairs and the time and horizon coordinates are recorded again. When this is repeated about five times an azimuth correction can be calculated by averaging the differences between the true azimuth as calculated by SHAMOS and the five or so measured azimuths that were recorded. When this correction is adjusted into the transit, the transit becomes astronomically tuned to the sun. There are several ways for SHAMOS to accomplish solar bearings for the user built into the routines and utilities, including an automated RS232 interface to the Sokkia Transit.